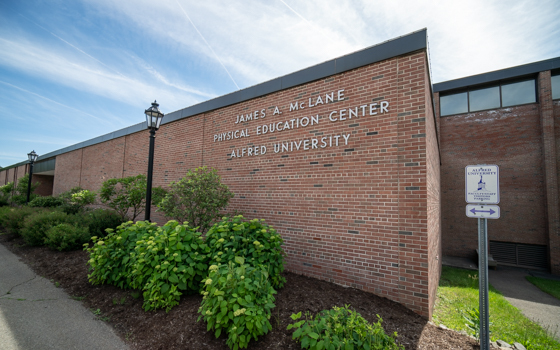 McLane Center, named in honor of former Alfred University athletic director James A. McLane, is the hub of intramural activity on campus. The modern fitness center located on the ground floor is a focal point for students, faculty and staff. Offices for the Department of Athletics and the Division of Athletic Training are also located in the McLane Center. Lebohner Pool, a 75-foot six lane swimming pool with diving area and one-meter and three-meter boards. Used by the varsity men's and women's swimming and diving teams. Two regulation-size basketball courts, which are also used for volleyball and several other indoor intramural activities. Two courts for handball, racquetball and squash. Jericho Field - Home course for the cross country teams and home field for the club rugby squads. Jericho Field is also used as a practice site by the football and men's and women's soccer teams.